I’ve been waiting for this day for a while. And I’m pretty darn excited it’s finally here. Y’all know way back in March, I got a chance to visit The Pioneer Woman at her ranch. Way back then, a tiny seed was planted. Since then it’s been growing. And now it has bloomed. 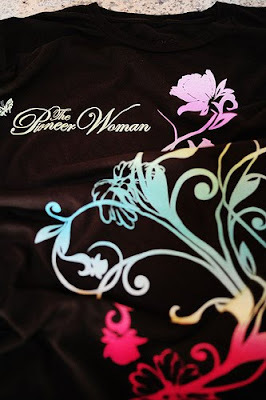 the shirt Wild Olive created with and for The Pioneer Woman for her Book Tour ’09. And she’s a wild one. She can’t be had for any price. Nope, she ain’t for sale. 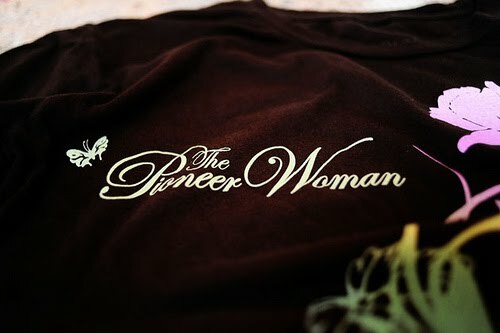 To get one, you have to visit The Pioneer Woman on her Book Tour ’09. Or, just for today, you can get one from Ree herself. She’s giving away 100 of these beauties. Go on now, get on over there… the contest ends soon. That is so awesome, Stefanie!!! It's a beautiful shirt, too! Stef! I am SOOOO excited for your, for Wild Olive! What a great opportunity for you!!! She was just here at the Mall of America. The crowd she had was HUGE!!!! Way to go!!!! !